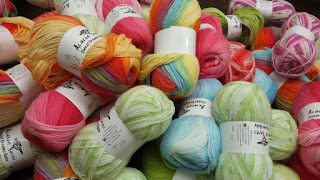 It is here at last, Classic Elites luxury yarns are now available at The Yarn And Fiber Company ! Classic Elites Alpaca Sox Yarn is simply wonderful, a mix of Alpaca and Merino Wool that is hard to beat, and the colors are simply spectacular. If you have not had a chance to check it out it looks and feels like a custom hand dye, but is an Alpaca blend, and quite reasonably priced. Most of the yarns come with a choice of free pattern, from sweaters and cardigans to hats and gloves. There is "Charmed", "Sinful" and "Forbidden" varying from 85% to 100% pure cashmere for that spectacular garment you always wanted to knit when you want to spoil yourself rotton! Fingerless mittens in Charmed are both soft and warm, Charmed is an exotic mixture of Cashmere and Mohair. Embrace is an exquisite 100% cashmere yarn, self striping, and simply gorgeous. One skein is over a half a pound of pure cashmere, 650 yards, and one simply spectacular garment. Lavish and Stormy are great sweater yarns in 100% Cashmere. The Cashmere yarns from Elite are available in all weights from fine all the way through super chunky, you can turn almost any pattern into a fantastic cashmere dream project! Other exotics from Classic Elite include a 100% baby camel yarn called Blithe, that makes spectacular shawls. Camel is extremely light, and airy, compared to wools, mohair and cashmere. Certainly one of the most exciting collections we have added, be sure to check it out!